Of course, the downside with such arachnophobic movies is what happens when movie viewers venture forth in the morning. Ohioans may be surprised at the large number of spiders living near at hand when heavy morning dews accentuate their gossamer creations. Spider numbers climb rapidly at this point in the season, fueled by burgeoning insect populations. The handiwork of these eight-legged weavers is revealed by heavy morning dews and preserved by intermittent precipitation. Although heavy rainfall has little impact on the spiders themselves, pounding downpours wreak havoc on delicate webs. Each individual spider web functions as an insecticidal trap. There are over 600 species of spiders found in Ohio and most feed almost exclusively on insects. The two types of spiders that are currently dominating (draping over?) landscapes are the sheetweb weavers (Family: Linyphiidae) and the Funnel Weavers (Family: Agelenidae). 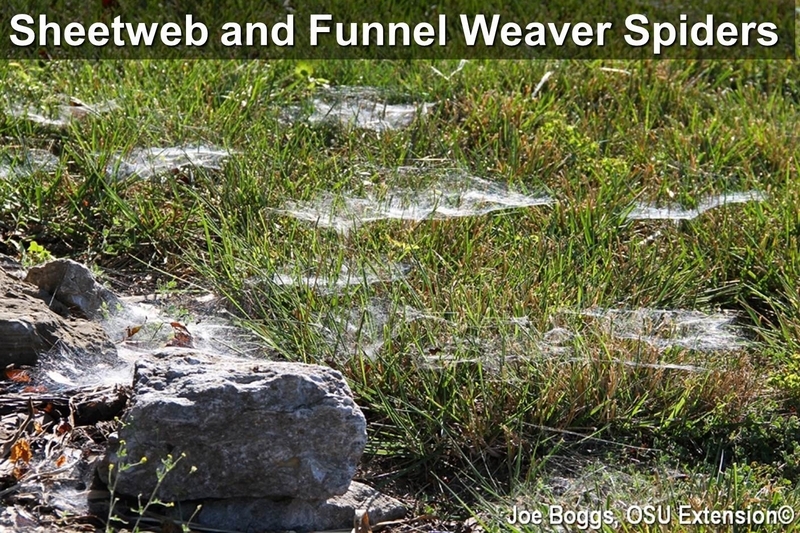 Funnel weavers produce large, flat, sheet-like webs spun across grass, under rocks or boards, or over the branches of shrubs such as yews and junipers. The webs slope gently towards a narrow funnel or tube where the spider resides, awaiting its next victim. The spiders are medium-sized and resemble small wolf spiders. Funnel webs may measure more than 1' across and can become very evident when covered by dew, or when they snare dust during droughty conditions. One of the more interesting sheetweb weavers is the bowl and doily weaver (Frontinella communis). This is one of the few spider species with males capable of producing webs; however, females still dominate web weaving. The spider constructs a complex web structure consisting of distinctly bowl-shaped webbing suspended from plant stems by a crisscrossing array of silk threads; this is the "bowl" in the common name. The bowl is anchored below by a horizontal array of interwoven silk threads; the "doily." Flying insects drop into the web-bowl after bouncing in pin-ball fashion off the interlacing silk threads used to suspend the web. Of course, when they drop into the web-bowl, they fall into the "arms" (and fangs!) of the awaiting spider! Although there are several insecticides labeled for spider control, this is not a recommended practice. Homeowners are urged to practice restraint, appreciation, and understanding. Spiders are very important in reducing insect pest populations; they provide a great service free-of-charge by reducing the need for controlling more significant pests.